A ride report by the Doc. Payson Canyon; Loafer Mountain Trailhead. Barreling down the mountainside on the Bennie Creek Cut-Off Trail is such a fun romp that I figured it would fit into my already overbooked Saturday schedule. One of the things I enjoy most about my new Fat Bike is that almost by design, I ain’t going to win any races. Having spent most of my saddle time on my 1993 Masi Road Bike, my new Mukluk 3 has given me permission to be a kid again. 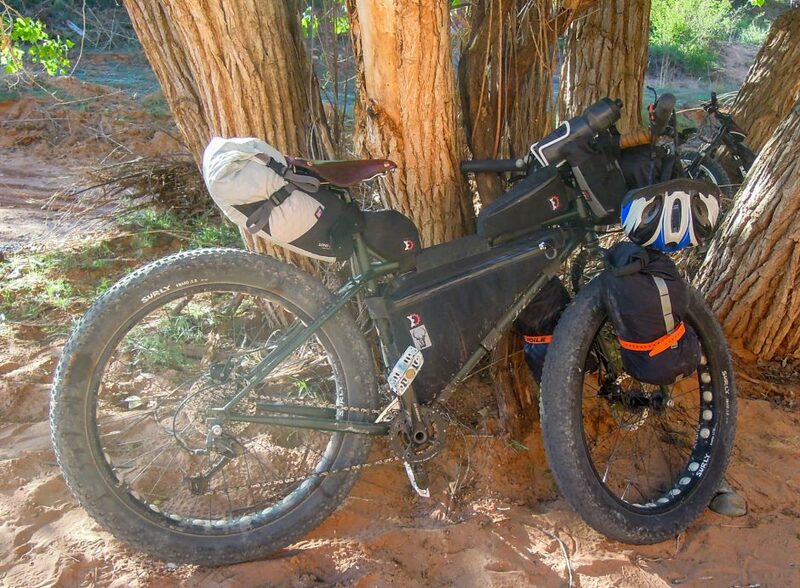 Fat biking is not about getting in the training miles or about speed or distance. Fat biking is about adventure! So driving up Payson Canyon (10 minutes from home), I parked at the Bennie Creek trailhead. In times past we have dropped a truck off at the top and bottom of the trail so we could avoid the 4.4 mile snaking climb up the mountain side to the Mt. 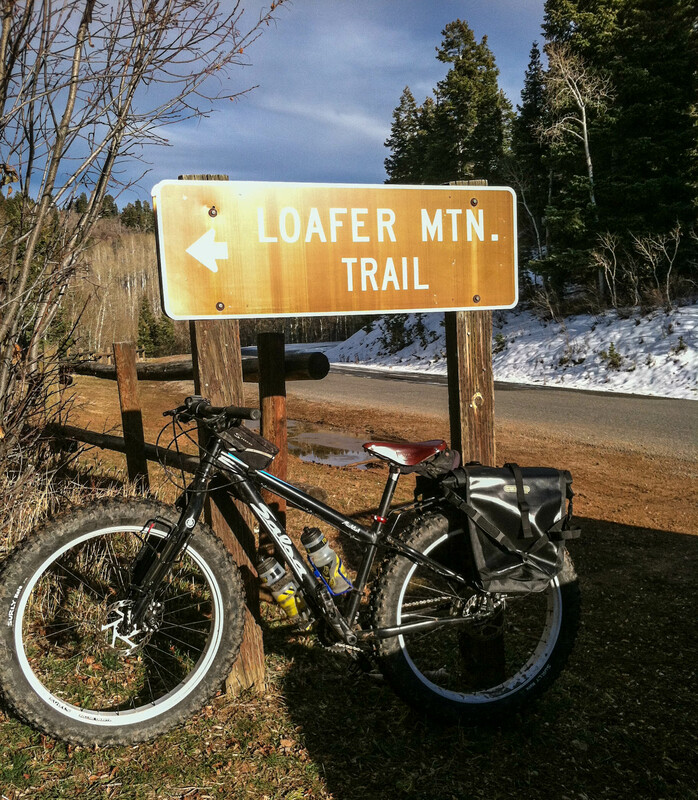 Loafer trailhead. However, today I was solo, so I parked at the base and began the 1400’ winding climb. Already crossing patches of snow on the road, I figured I would take it slow and steady as there would be snow on the road this November day. The past summer, we did a 300+ mile tour through Yellowstone and the Tetons. We had a wonderful time, but I was on my trusted Masi (not ready to fork out the $$$ for a tour bike) and did not have the advantage of granny gears. My Mukluk was designed with granny in mind and ascending up the pavement was really enjoyable. Cool afternoon air and very little traffic. Seriously, these low gears are great! I plunged right into my first patch of snow on a 6% uphill grade. I’m running with Surly Nate tires and found I could roll right through the packed snow without a slip or swagger. 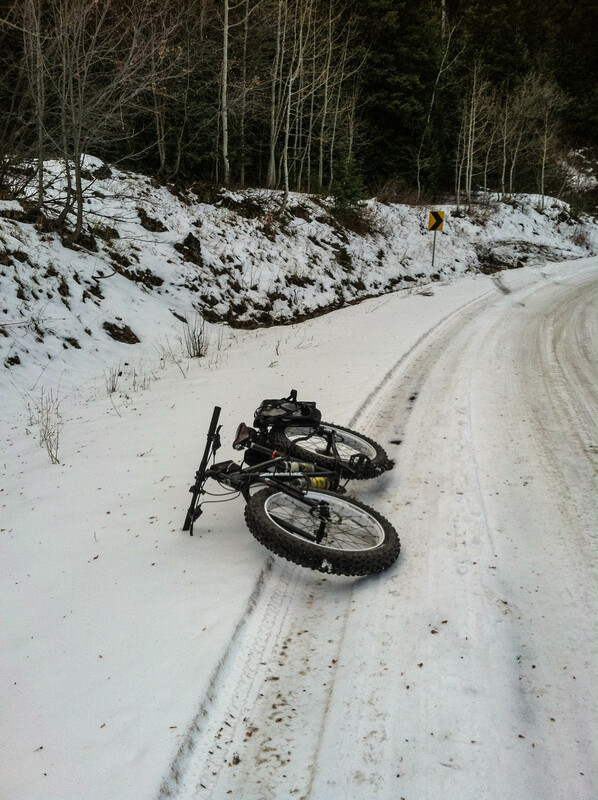 Not so on the black ice, as I found myself sliding sideways and scrambling for packed snow or pavement. Overall, I was please and impressed with the grip and grab of my tires. First snow of the season up Payson Canyon. The Mt Loafer trailhead came sooner than expected and one look down the trail assured me that today would be an adventure of snow and mud. The first short descent, confirmed that I would be getting up close and personal with the mud. 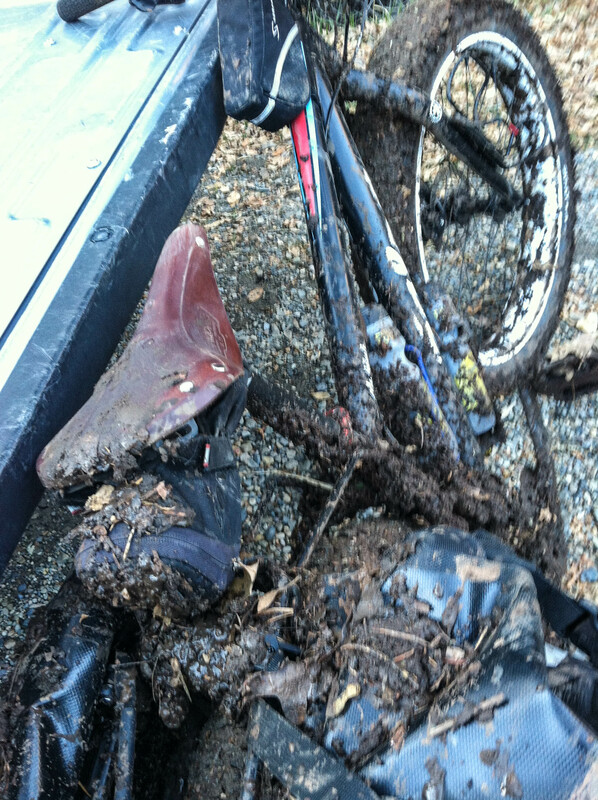 During the muddy patches my tires would gather the mud and then descending it would fly everywhere. A quarter mile up a hill, I realized I had missed a turn, but was soon back on course. The Nate tires have great gripping capacity, that is, when there is something to grip. Six inches of horse trodden mud doesn’t give much to hang on to and so fishtailing was in style. At one point, I was thankful for a strategically placed tree that kept me on the trail as I was at one point facing down the trail but definitely sliding the other direction. I noticed that the front tire was losing pressure – not quickly but it definitely was. Down to about 4 pounds I stopped as the trail flowed through a meadow clearing to increase the pressure. A slow leak, I’m pretty sure it was residual from yesterdays right down the Salem Canal trail which in now infested with goat heads (aka Puncturevine, Tribulus terrestris L.). I fixed two flats yesterday, checked to make sure there were no more residual thorns, but obviously I must have missed one. But with pressure restored, I was back on board and bombing down the mountain. The Bennie Creek trail is like a roller coaster. Sweeping descents with enough ups to give you the whoop-tee-do experience that we all love. Plenty of banked turns with enough rocks and roots to keep you honest. Once out of the thickest mud my only problem was the setting sun, which at times was blinding. I mentally made a note that this would be a better morning ride. Finally, the creek is within earshot and then the final burst through the canopied forest back to road, my truck and civilization. Covered with mud and an adventure to write about. Driving back home the sun had gone behind the mountains and I knew I timed my late afternoon ride just right. This is one of the things that is so cool about living in Utah. Thirty minutes is all that separates me from being in the thick of the forest – not within sight or sound of anyone – and a warm shower. Total mess, but worth every minute.